Celebrating yourself and practising gratitude can increase happiness, motivation and help you set goals. When was the last time you prepared an acceptance speech? 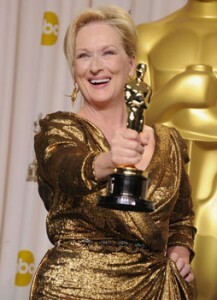 Well it’s true that unless you’re Meryl Streep you probably don’t have a mantelpiece heaving with gongs (your parents spare room still decorated with your childhood swimming certificates don’t count, sorry). Not so many opportunities for us regular joes to take the spotlight and acknowledge the people who have helped us reach such lofty heights. You ARE a winner. You are here right now in 2013, doing your thing. And if you’re reading my blog, you most likely have an interest in making this year even better than all the ones you’ve lived so far. So, how about writing your own acceptance speech for your life? Your life so far, right up to this point of existence. How about giving thanks and acknowledgement for everyone who has played a part in where you are right now? Think about the archetypal Oscar speech. Our celluloid heroes take the opportunity to thank the people who have helped them and who collectively deserve recognition in their achievement. And although our own speech may not include our Hollywood agent, we are all people having a life experience of other people. It is possible to achieve some things on our own, but most of us have been blessed at some point with the support/inspiration/example of another person. Can you run a scan of your life and pinpoint those people? The ones you remember and think “yeah, a part of me exists today because of that experience”. I am so happy that I have had the honour of adding my clients to this year’s list. Being a part of the power of people working together to overcome chronic fatigue, reverse type2 diabetes, manage stress, begin exercising regularly, get their dream job, increase their confidence, regain their cognition, eradicate PMT, etc, has been truly amazing. It also shows that being of service to others deserves just as much space on your list, because by helping others we help ourselves. what is/was it about them that had such a profound effect on you? Sometimes the reason is hard to pin down, but somehow we were able to relate to that person, connect with them, bounce off them, trust them. They were also probably in exactly the right place at the right time for you. Most of us possess enough knowledge and skills to complete a task, but we work better with people around us. In our corner. On our side. This was exactly my experience during my health coaching training. Technically, I had the skills and the resources to complete the course on my own. But even if I had been able to muster the motivation with only myself to be accountable to, it would not have been the enriching, life changing experience that it was without my health coach and my fellow students to support me and keep me on track. When we think about the people who have helped us become who we are today, very often what they did was give you a safe space and provided the right tools for you to step into your own power. They didn’t do it for you. They empowered you to do it for your self in your own unique way. 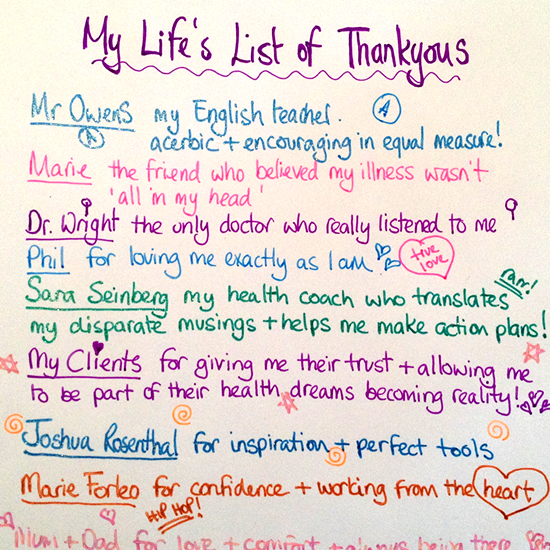 So, you’ve taken the time for an energising gratitude practise. What happens next? This is the really exciting bit – the BIG BANG ACTION STEP to move you forward. It’s a brand new year with fresh new goals. Keeping in mind the lesson that we people are connected to each other through our experiences, who will feature in the goals you want to achieve this year? Who do you need in your life to help you achieve those goals? Who will be in your speech this time next year? It could be a career advisor to help you get that job you know you can shine in. A friendship that could develop into a linchpin of support for both of you. A health coach to give you that safe space and the tools to achieve your health and happiness dreams. Get proactive in your search for the people who will become your collaborators in the life you really want to lead! Leave a comment below about who you want on your list! Or post some gratitude about who is on your list right now. Studies show that writing notes of gratitude increases our own happiness, promotes quality sleep and helps us reach our goals. If you want to give yourself the gift of some space to explore the possibilities for your health and happiness in this fresh new year, contact me to arrange a free, no obligation Health Breakthrough Session and see how the power of partnership can transform you! I’ll leave you with a fab video that shows how expressing gratitude in your own unique way can make everyone in the room (including you) feel amazing!